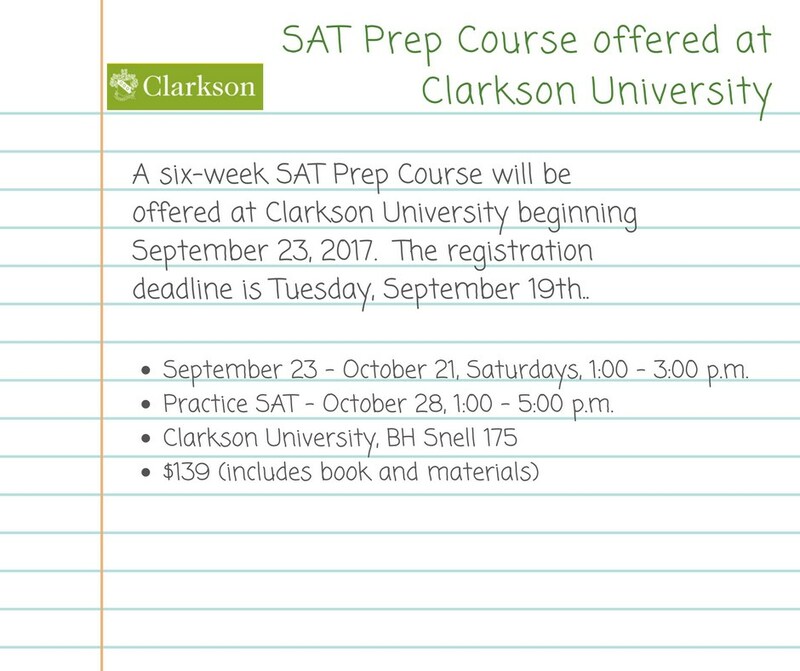 A six-week SAT Prep Course will be offered at Clarkson University beginning September 23, 2017. The registration deadline is Tuesday, September 19th. A six-week SAT Prep Course will be offered at Clarkson University beginning September 23, 2017. The registration deadline is Tuesday, September 19th.. The SAT Prep Course consists of six sessions that focus on evidence-based reading, writing and math. During the first session, students take a pretest and test-taking strategies are discussed. Subsequent sessions focus on each of the individual content areas. During the last session, a full-length practice SAT is given. Test scores are given to students along with the correct answers in order to help better prepare them for the actual test. September 23 - October 21, Saturdays, 1:00 - 3:00 p.m. Practice SAT - October 28, 1:00 - 5:00 p.m.
For more information, you may contact Kim Jukic in Test Preparation at Clarkson University at 268-3998 or e-mail testprep@clarkson.edu. You may also visit us at http://www.clarkson.edu/testprep.